Desription ......... 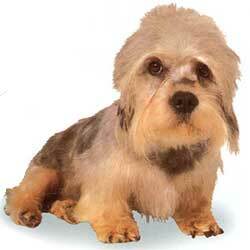 The Dandie Dinmont is another Terrier whose exterior can be described as marvelous. His look can be called affectionate: enormous round eyes nearly penetrate you. 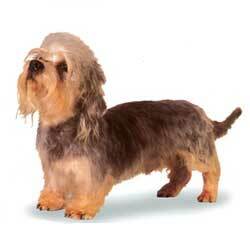 The Dandie Dinmont has a big head, which is crowned with a kind of hat with earflaps. The color can be of two kinds: from tawny to pale-yellow (“mustard”) and from jet-black to silvery-gray (“pepper”). 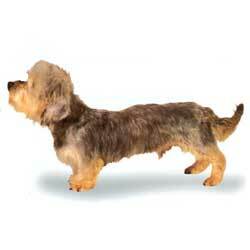 The length of his body is much greater than his height; his weight can reach 22 pounds, as he isn’t a heavy dog. He doesn’t eat too much. He is happy in the company of people, and, naturally, can make a great member of the family. In his actions, he never shows haste, but if a rat or a squirrel crosses his territory, the Dandie Dinmont will spring into action.